Thank you for joining us on the LIVE Commentary. You can visit KhelNow.com/news for more insights on the game! Hope to see you soon. . Thank you all for being a fantastic audience. If you liked my commentary, you can review or follow me on my Khel Now page. Thanks! Signing off! 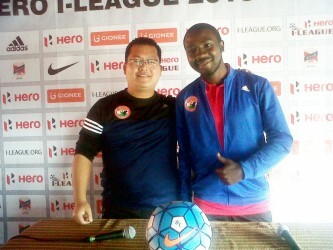 Mohun Bagan played a better first half and the last thirty minutes of the league. With a second string side, the Kolkata giants will be happy with a draw. They should take the AFC Cup a little more seriously if they wish to take Indian football ahead and grow above Indian shores. The home team showed brilliant hard work and was good on the counter. West will be someone to watch out in the second leg. The coach will be happy with his team's performance at home in the second half! 90 + 3' FINAL WHISTLE!!!!! BOTH TEAMS SCORE ONE GOAL EACH! 90 + 2' Prabir plays a through ball to Balwant but the opposition goalkeeper comes out to clear his lines! Counter from Valencia. 90 + 1' Sehnaj standing in the CR7 pose. Tries the spectacular but is painfully high above the bar! 90' Katsumi is fouled just outside the Valencia box. Nice area for a free kick! 90' Extra time: 3 minutes! 89' Sehnaj tries a Ronaldo but is sadly over! 89' Katsumi and Sehnaj standing over a free kick deep in Valencia's half. 88' Penalty call goes begging as Balwant makes a superb run into the box from a Sehnaj pass. The striker takes on four defenders and is brought down, but doesn't interests the ref. 87' Good ball from the right but is headed out by Eduardo. Katsumi clears. Ball back to Valencia defenders. 86' Sehnaj looses the ball in the middle of the park. Counter attack from Valencia, but the cross is headed out by Anas. MB launch a counter but a slow one. 85' Katsumi passes to Balwant, who plays it on to Bikramjit, who plays it on to Prabir Das. Das crosses and the ball is headed just over by Duffey. 84' West tries to find the left winger in the box with a good through but the ball is a little too heavy. Goes out for a goalkick. 81' West makes a brilliant run into the box and lets a shot from his left foot. Shilton makes a critical save. Ball out for a corner. 79' Both teams playing with long balls. Balls coming in the boxes for strikers to connect and reach. Valencia playing at equal peg. 74' Long ball into the MB Box. Anas and Eduardo get confused and do not clear. Goal line save from Subhashish. Valencia attacking with throttle. 73' Bikramjit plays a ball to Balwant. The striker turns and lets off a left footer. Easily saved! 71' Raynier makes way to Pankaj. Prabir makes a run on the right and plays it to Duffey. The striker loses the ball on the left wing. 70' WEST SCORES!!!! THE SCORES ARE LEVEL! PENALLLLLLLTTTTTTTTYY to Club Valencia! Silly foul from Subhashish Bose. Hand balls while collecting a cross! 69' MB attack once again. Bikramjit plays it to a deep dropping Duffey, who plays it to Katsumi. Katsumi tries to lays it into the path of Balwant mut is collected by the goalkeeper. 66' Good long ball to Prabir on the right wing. Das takes it into the box and falls down. Penalty appeals turned down. 63' Shankarlal Chakroborty firing instructions to Raynier from the touchline. The youngster is slowly being bred well. 62' Balwant and Raynier exchange passes on the left wing as MB play higher up the pitch. 56' Prabir makes a run on the right wing and cuts in for Bikramjit. Goalkeeper makes another key save! 55' Duffey tries to release Balwant with a lobbed ball into the box. Just a little too much weight. 53' Valencia defender injured. Being treated close to his own box. Ball given to MB goalkeeper Shilton Paul. Anas plays a long ball to Balwant. 49' Another chance goes begging for MB as a long ball fails to find Duffey. The Scot getting a little frustated now. 48' Valencia makes the first change. Jersey no. 7 comes on for Jersey no. 15. 46' Valencia begin the second half with the kick off. . Teams walking out! Mohun Bagan looking excited and with added vigour! DO YOU THINK Mohun Bagan can score in the second half? If yes, comment who! Who has been your favourite player this season!? Please comment! Mohun Bagan easily the better side in the first 45 minutes as they take the lead via a Darryl Duffey goal. The Green and Maroons make the better chances, but have been pegged back at times by the Valencia attack, spear headed by West and Kaka. Prince has also made his contribution for the home team. Katsumi, Bikramjit and Duffey are playing the key roles for the visitors in Maldives. 36' Mohun Bagan playing with higher intensity and are playing more attacking football. Katsumi playing the lynchpin. 34' Bikramjit plays a ball to Katsumi, who crosses into the box from the right. Balwant tries to reach, but is comfortably collected by the goalkeeper! IF MB qualifies from these two leagues, they may face Bengaluru FC in the AFC Cp. 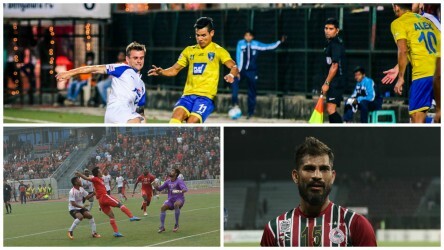 The first time two Indian clubs face each other in the AFC Cup. How do you feel? Leave your comments below! 30' Mohun Bagan trying to gain back the impetus. 29' Valencia makes another attack with attacking player Princ in the thick of action. Coming closer to MB goal. 26' The left winger cuts into the MB box but Eduardo deals with him with comfort. No imminent danger. 24' Club Valencia get another corner after a long free kick is cleared out by Eduardo. 22' Valencia trying to play with the ball at their feet and building from the back. The team is trying to slowly get back into the game. 20' Mohun Bagan looking the better side on the ball as they control proceedings. Bikramjit Singh handling the game-play with ease. 18' Good passing session for MB as Duffey and Bikramjit from a goal kick. 15' Kaka trying to make things happen in the middle of the park for Valencia but no passes stringed. 13' Prabir Das tries a long ball to Duffey. Ball goes out of play! 12' Bikramjit Singh fouled. Freekick to MB. Bikramjit's free-kick flies over the bar. 11' Bikramjit playing as a pivot and exchanges a few passes with Anas and Prabir from the middle of the pitch. Duffy fouls on the left side of the pitch, free kick to Valencia. 09' Club Valencia trying to gain some momentum in the middle of the park but the ball goes out! 08' Mohun Bagan take the early initiative as the visitors score the first goal! 06' GOOOALLL!! 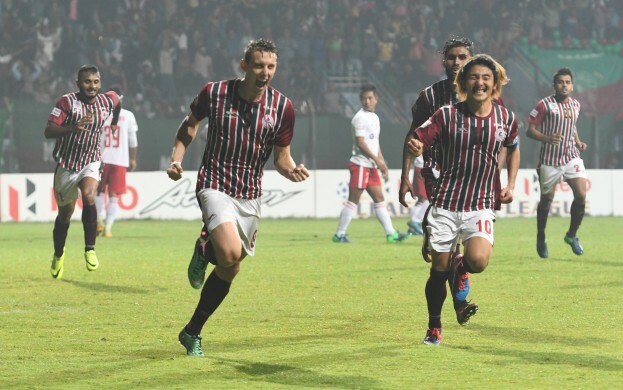 Duffy Scored for Mohun Bagan . Prabir Das provided the assist . 03' Mohun Bagan have started the match on upper hand . 01' The game has started as both teams start the proceedings! 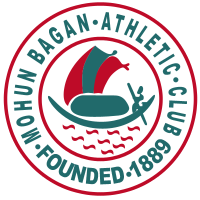 Kolkata giants Mohun Bagan have had a rich history in both domestic and continental competition over the years. The Mariners, who are representing Indian football in this year’s AFC Cup, will be facing Maldives club Valencia FC in the first leg of the AFC Cup Qualifier away. Hello and welcome to the Live match streaming of the AFC Cup match between Mohun Bagan and Club Valencia FC.